Turn night into day with this powerful 4-LED flashlight. It draws power directly from the VEX ARM® Cortex®-based Microcontroller. Switch it on, and see in the dark. Easy to mount up off your robot using the included threaded standoffs. The VEX Flashlight can be used in conjunction with a light sensor or camera to provide a source of white light. 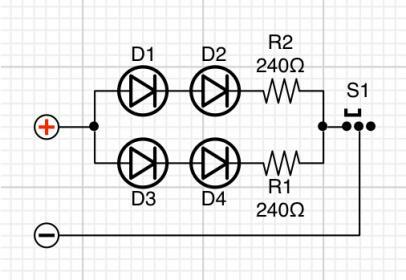 The Flashlight is connected to the microcontroller via a 2-wire power connection. The flashlight does not contain any control circuitry, so it will run continuously while it receives power. It has an on/off slide switch, so it can be manually disabled if desired. The VEX Flashlight provides a source of illumination for a light sensor. 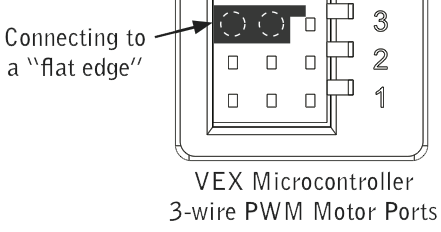 It is typically plugged into the power pins of a 3-wire motor port (the two pins furthest from the index tab), and will operate continuously while the VEX microcontroller is powered. If attached to a 2-wire motor port, the flashlight can be controlled by setting the speed of the motor port. Setting the motor speed to "stopped" will turn the flashlight off. Setting it to "full speed" will turn the flashlight on, though only in one direction (forward or reverse), depending on the polarity of the connection to the 2-wire motor port.